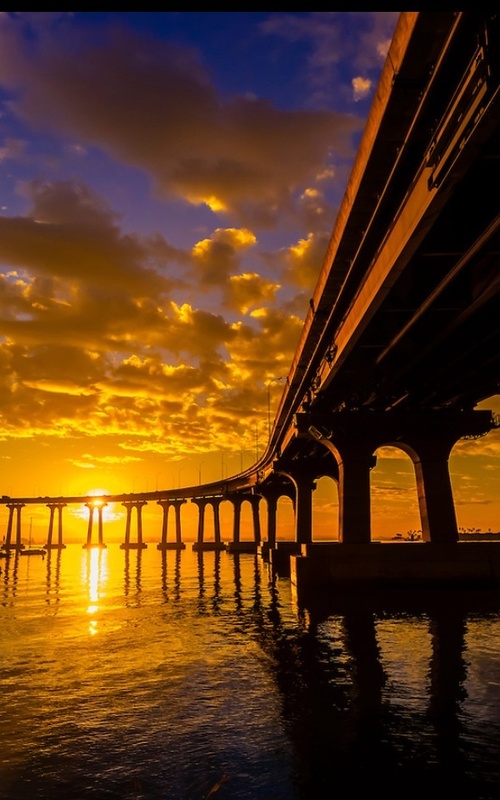 The San Diego–Coronado Bridge, locally referred to as the Coronado Bridge, is a "prestressed concrete/steel" girder bridge, crossing over San Diego Bay in the United States, linking San Diego with Coronado, California. The bridge is signed as part of State Route 75. The bridge contains five lanes: two eastbound, two westbound, and a reversible middle lane with a moveable barrier system which can be used to create a third lane in either direction in response to traffic volume. The eastern end of the bridge connects directly to a T interchange with Interstate 5, just southeast of downtown San Diego. It is designated and signed as part of California State Highway 75. The bridge was designed entirely and exclusively for motor vehicle traffic; there are no pedestrian walkways, bike paths, or shoulders ("breakdown lanes"). Beginning in 2008, cyclists have the once-a-year opportunity to ride over the bridge in the Bike the Bay "fun ride".